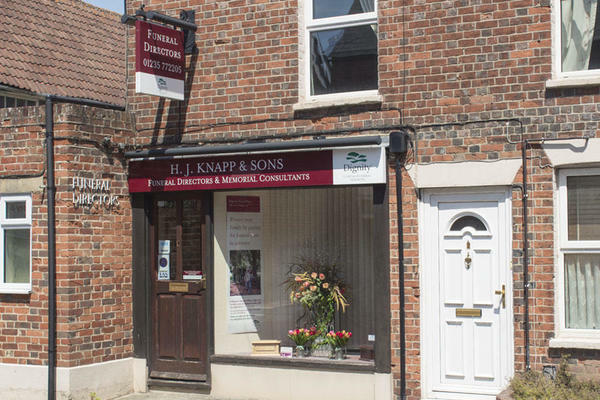 We are H J Knapp & Sons Funeral Directors in Wantage. We see it is our duty and privilege to support families in our Oxfordshire community, helping people through some of the most difficult times of their lives. We understand that life with those you love is deeply personal, and your loved one's funeral should be no different. Our caring team of professionals will honour any final wishes, tailoring any details to be just as you want them to be. From a traditional religious service, to a colourful woodland burial, we can arrange anything that you think its fitting for your loved one's farewell. We will take the time to get to know you, treating you as if you were one of our own family. No matter what time of the day, please call us and we will be here to help you. Call us today on 01235 772205 to talk through your personal requirements. At H J Knapp & Sons Funeral Directors, we understand how special life is with those that you love. For us, every funeral is unique and personal. We have a service to fulfil every wish, with every detail carried out with the same uncompromising quality of care. From a traditional service, to a colourful woodland burial, your options are limitless with our Full Service Funeral. If you have a little more flexibility when it comes to arrangements, then we can provide a Simple Funeral for a lower cost. There is car parking available at Beacon, Portway. We are facing Headmasters hairdressers, adjacent to the side of Wantage Methodist Church. Our staff are available 24 hours a day on 01235 772205 if you require our services outside of these hours. Thank you for posting your review online. I am glad that we were able to provide you with the care and support needed at this time and that you were so well looked after by our team. Suzanne was at all times attentive, understanding and efficient. I am sure she is a very valued member of your staff. There was a bit of a mix up at the graveside but probably not much which could have been done to avoid it. It was simply that there was not enough space for the normal ceremony at the graveside. Thank you for your 4* rating and comments. We are very happy to hear that you were satisfied with the services provided by our staff and we appreciate your comments regarding the council owned, Chain Hill Cemetery. Thank you for once again for your 4* rating and comments. The service provided by HJ Knapp was excellent. From the first conversation with Suzanne through to her call to me the day after the funeral, everything was dealt with courteously, sensitively and with dignity. There were several nice unexpected little touches in what they did that just helps get through a difficult time. The funeral service and burial itself was faultless, afterwards all the family agreed that it had been just perfect. Thank you so much. Thank you for taking the time to share your thoughts with us. I am pleased that we provided the highest level of care and guidance to you and your family and that we were able to help make things easier for you at such a difficult time. The service we received from H J Knapp was brilliant. Suzanne James saw that everything was done that we had asked for. The day of the funeral everything went perfect, the best you could ask for on such a sad occasion. My brothers, My Mother and myself were very pleased with all aspects of the funeral. Thank you for posting your review online. I am pleased that you were so well looked after by our team and that all of your wishes and requirements were carried out as you had requested. Very efficient throughout. All details fully explained which aided decision making. Suzanne was main point of contact and was really helpful; Barry was Funeral Director and again could not have done more. Thought it very touching to receive a small vase of flowers which was much appreciated. Thank you for sharing your thoughts with us on your online review. I am pleased that you were so well looked after by our team and that we were able to provide you with the support and guidance needed. I was appropriately consulted and informed throughout the process. I was treated with kindness and concern and reassured when necessary. Everything I asked for happened.Many thanks to those who guided me through. Thank you for sharing your experience with us on your online review. I am happy to hear that we were able to help ease any worries that you may have had and provide you with the support and guidance needed. At such a difficult and emotional time it was such a relief to have such an excellent, friendly and caring service. I can only say a huge thank you to everyone, especially Susan who was absolutely marvellous. Thank you for taking the time to send your online review to us. I am happy to hear that we were able to help ease any worries that you may have had, and that we were able to provide you with the care and support needed at this time. I was able to make plans. I would definitely recommend their service. Thank you for posting your review online. I am pleased that we were able to look after you and your family at this difficult time.